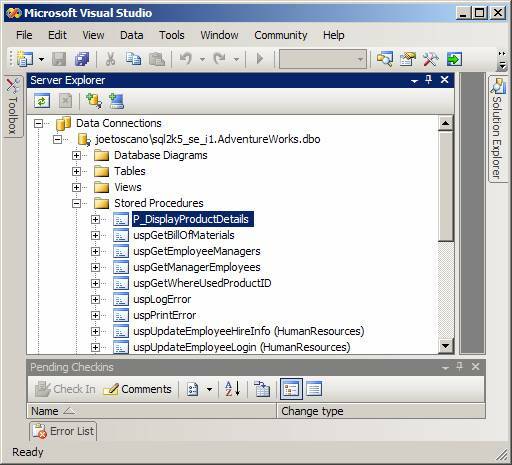 Learn how to prepare to debug a stored procedure from Visual Studio 2005. Before any debugging can take place, you first must create the store procedure. This can be done either by using Management Studio/New Query or by building the procedure graphically in Visual Studio 2005. Stored procedures can be created in Visual Studio by opening a new database project and using the Visual Studio Installed Templates. Either way, once the procedure exists, you are ready to start debugging from Visual Studio 2005. When you start up Visual Studio for debugging purposes, you don't have to create a project. Instead, you can create a connection to the AdventureWorks database from Server Explorer, as I have done in the screenshot shown in Figure 1. (You will have to provide your server name along with your login credentials and choose the AdventureWorks database.) Then you can drill down and open up the stored procedures folder. Next, right click on the procedure you wish to debug and choose Step Into Stored Procedure from the context menu. Then you are ready to start debugging! About the author: Joe Toscano is a SQL Server instructor, speaker and database consultant for Micro Endeavors Inc. He has worked extensively with SQL Server since version 6.5, as well as Sybase and Informix prior to that. Toscano's areas of expertise include Data Transformation Services (DTS), Integration Services (SSIS), Transact-SQL (T-SQL) programming, data warehousing, performance tuning, replication, high availability (mirroring), security, disaster recovery, upgrading, migration projects and lights-out DBA tasks.